I'm a vitamin-packed blend of nutritious, energy-boosting superfoods. I pack a huge nutritional kick in small doses, making me the perfect addition to your Nutribuddy shakes or smoothies! Did I mention I taste great, too? I'll help you boost your health and wellbeing in a simple, easy-to-use and delicious way. I'll be your personal superfood shield and power booster! Every scoop of me is packed with with antioxidants, vitamins, plant-based protein and fibre, helping you to take on the day and boost your health, energy, immunity and skin day after day. Want to eat healthily, but always find that your busy lifestyle gets in the way? Thankfully, as a handy little pack of superfood goodness, I'm full of the good stuff but require minimal time and effort. I'm a convenient way to boost your day-to-day health and wellbeing! I'm the perfect addition to the Nutribuddy Breakfast Shake or Shake Complete! Add a scoop or two direct to your shaker for a satisfying crunchy drink, or add me to your blender with your shake if you'd prefer something smooth. I'm delicious in smoothies and sprinkled on cereals, too! Did you know that 95% of all vitamins and supplements sold today fall into the synthetic category? Well, I've got no time for synthetic ingredients, fillers, sweeteners or anything else artificial and provide a mighty vitamin and antioxidant boost through 100% natural whole foods alone. Numerous studies have shown that flavonoids and catechins in green tea are able to increase the metabolic rate and promote healthy weight loss. Don't like the taste of green tea? No problem, just have a couple of scoops of me every day - I contain matcha green tea, the richest and most powerful green tea of them all! Flaxseeds, coconut and matcha green tea are all loaded with antioxidants... and I contain each of them! If you're looking for an immunity boost, a decreased risk of several diseases and youthful looking skin, antioxidants should be your best friend. I'm an easy way to pack in health-boosting antioxidants on a daily basis! Increasing your protein intake can help you maintain a healthy weight by filling you up for longer, and therefore, eliminating the need to snack. For such a small serving, I sure pack a mighty plant protein kick and make a great way to boost your daily intake of protein, all whilst being 100% plant-based and suitable for vegans! Pretty cool, if I do say so myself. Glowy, youthful, hydrated and even skin? Yes, please! I contain flaxseeds, an amazing, vegan source of omega-3 - which you could call the skin holy-grail! Omega-3s help to lock in skin moisture and act as an anti-inflammatory, helping to keep acne, dry skin and eczema at bay and slow down ageing. I don't mean to brag, but my ingredient list and nutritional values are pretty awesome. I'm very proud of my contents! Let me introduce you to them. I don’t mean to brag, but my nutritional values are pretty awesome. I’m super proud of pure, powerful superfood ingredients! Let me introduce you to them. I don't mean to brag, but my nutritional values are pretty awesome. I'm super proud of pure, powerful superfood ingredients! Let me introduce you to them. I couldn't be easier to use! Like a good crunch? 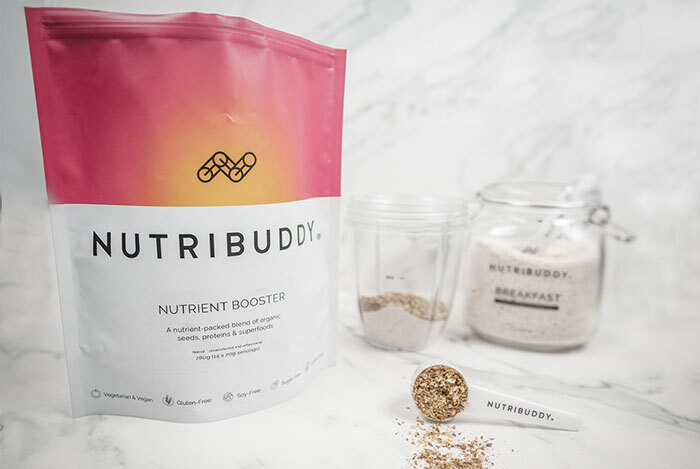 Just add a scoop of me to your Nutribuddy Breakfast Shake, Shake Complete or Sculpting Protein and shake, shake, shake! You can drink me on the go for a filling, nutritious, crunchy treat. Prefer things on the smooth side? No problem! Pop 1 scoop of me to your blender along with 3 scoops of your chosen Nutribuddy Shake. If you like, you can add some snazzy ingredients such as fruit or greens, but that's totally optional. Then, add 300-400ml of liquid and whizz everything together. 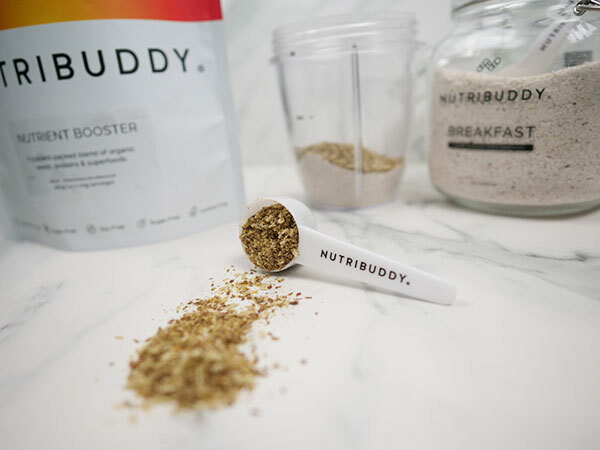 Perfect - now you can pour out your yummy shake into your Nutribuddy shaker and drink up! I can also be added to other fruit smoothies or shakes as you please! I add a lovely bit of extra flavour and crunch when sprinkled on cereals, too! Love adding this to my breakfast shake! Will have to order more quickly! I don’t even use the blender I love the taste and feel of the bits. And my two year old loves it too lol he always wants to finish my shake and he’s very picky!!! !